While there is no such company as Equitable Health Insurance, you may be looking for Equitable Life & Casualty Insurance Company. Equitable, as it is also known, does not offer general health insurance coverage, but does supplemental health insurance such as Medicare Supplements, insurance for short-term nursing home stays, and CancerCare+. Get prices for healthcare coverage that fits your needs. Put your zip code in the box to find out health insurance rates for you and your family. Equitable was founded in 1935 by the grandfather of the company’s current Chairman and CEO, E. Rod Ross. Today, the company’s goal is to be the premier life and health insurer for American senior citizens, Ross calls “The Ultimate Generation.” Equitable began offering Medicare Supplement products in the year that Medicare was introduced. Today, Equitable is licensed in 44 states and the District of Columbia. Equitable has agents in all states (and Washington, D.C.) that it offers coverage. It does not publicize their information. Once you become an enrollee in one or more of their insurance plans, you will be put in touch with a local agent. You can apply for coverage from Equitable by calling toll-free, 877-358-4060. Customer service can be reached at 800-352-5170. You can call anytime from 7:00 a.m. to 5:30 p.m. Mountain Time, Monday through Friday. 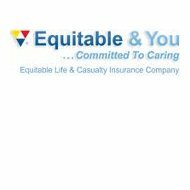 Equitable offers a line of health and life insurance products for seniors, including Medicare supplemental insurance with the EquiChoice or USA MCO programs; life insurance through EquiLIFE LEGACY; and cash benefit plans such as CancerCare+, Hospital Indemnity, and Short-Stay Nursing Home coverage. The company encourages you to use their website and click on the type of insurance you are interested in to submit a quote request to the appropriate agent. You can also keep track of the status of pending claims, and look up your claim history online. https://secure.equilife.com/index.cfm Signup is a simple three-step process: provide your Equitable policy number and the last four digits of your Social Security number; create a login and password; and create an account security question and voilá! Instead of calling and harassing your insurance agent, you can keep up with your submission as it goes through claims process. Equitable prides itself on having a quick claims process of five days or less. They base this assertion on verifiable data collected for all Equitable insurance claims submitted between January 2006 and December 2010. Equitable also features an automatic Medicare crossover claims program. Equitable Insurance Company is always looking to contract with independent agents who are interested in becoming a partner with Equitable. You must be interested in serving the senior market, as well as honest, concerned, and caring. If you are attracted to this opportunity, call the Agency Department at 800-352-5121 or send an email to [email protected]. Agents are 100% vested in Equitable contracts from the minute they sign them. Equitable Life & Casualty Insurance Company is very supportive of the community it is based in and takes pride in its good corporate citizenship by giving back to the community. The company sponsors “Profiles in Caring,” a local, weekly television program showcasing generous individuals and organizations. Equitable helped create an “Ambassadors of Caring” award to acknowledge these selfless people and extraordinary organizations, and ensure that their good deeds do not go unnoticed. Are you thinking about switching careers? What about health insurance? Do not be left uninsured, get health insurance quotes by entering your zip code in the box below.